This wind map of western Europe was originally published as part of the European Wind Atlas. The details on how to interpret the colours are given in the table below. Note that the data for Norway, Sweden and Finland are from a later study and are calculated for 45 m height above ground level assuming an open plain. The purple zones are the areas with the strongest winds while the blue zones have the weakest winds. The dividing lines between the different zones are not as sharp as they appear on the map. In reality, the areas tend to blend smoothly into one another. Note also that the colours on the map assume that the globe is round without obstacles to the wind or varying roughness of the terrain. Therefore good, windy sites for wind turbines on hills and ridges the yellow or green areas of the map may be found, while there is little wind in sheltered terrain in the purple areas. Actual local differences in the terrain will mean that the picture will be much more complicated, if we take a closer look. Note that the calculated mean power of the wind in the table is approximately twice the power of the wind at the given mean wind speed, as will be clear in the next pages. Note also that actual local differences in the terrain will mean that the picture will be much more complicated, if we take a closer look. Wind map of Netherlands . 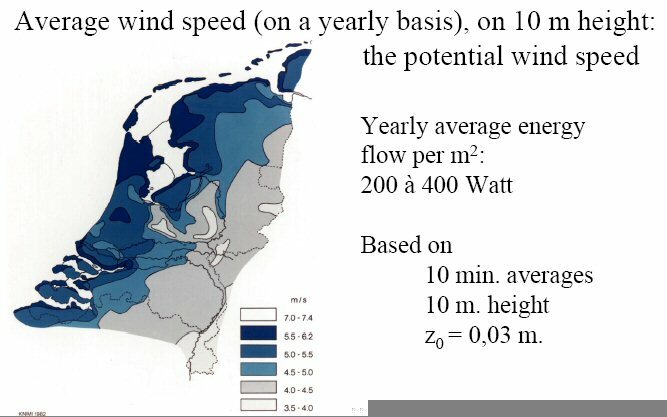 The wind map of Netherlands is given in the image, together with relevant information. However, as already explained, the map is not sufficient for actually locating a wind turbine, since it was generated mechanically, without detailed verification in the terrain. In order to make proper calculation of annual electricity output one would have to go to the prospective site and verify e.g. the roughness and locate obstacles and check for new buildings, trees etc.